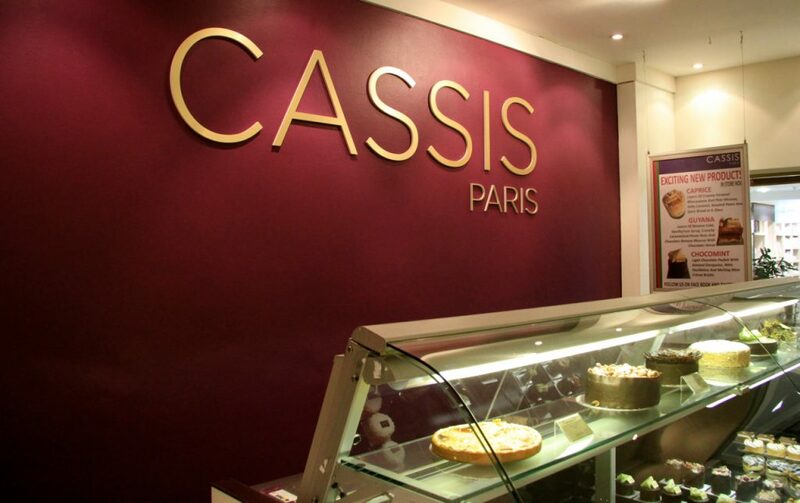 Ooh la la: the first three words that spring to mind when stepping into one of Cassis Paris’s patisseries. Partly because you can immediately tell that the little pieces of pastry perfection staring back at you from behind the glass are of a quality you don’t see every day. But mostly because you instinctively know that this little trip into Parisian paradise is not going to end well for your waistline. Though any reservations about weight quickly evaporate as you stand eye to eye with row after row of exquisite edible architecture, filled with praline feuilletine, chocolate ganache, butter cream, chou, and whipped mascarpone. As you’re whisked into a fantastical world of Forêt Noire (mini black forest), Douceur Noisette (layers of hazelnut biscuit, chocolate mousse and chocolate cream) and melting vanilla crème brulee, the question at hand is not whether you should dive in face first, but where you should start. Run by master pastry chef Patrick Moreau, Cassis Paris selects the very best ingredients to create their selection of baked goods. They use real chocolate, real butter and imported French flour to produce a wide variety of French gateaux, viennoiseries and macarons. Besides the intricate chocolate treasures I was drawn to straight away, their shelves are stacked with with tarts, buns, croissants, petits fours, brioche, quiche, baguettes and bread loaves of all shapes and sizes. I tried the Succès, a mix of almond meringue, light vanilla butter cream, nougatine pieces and raspberries. 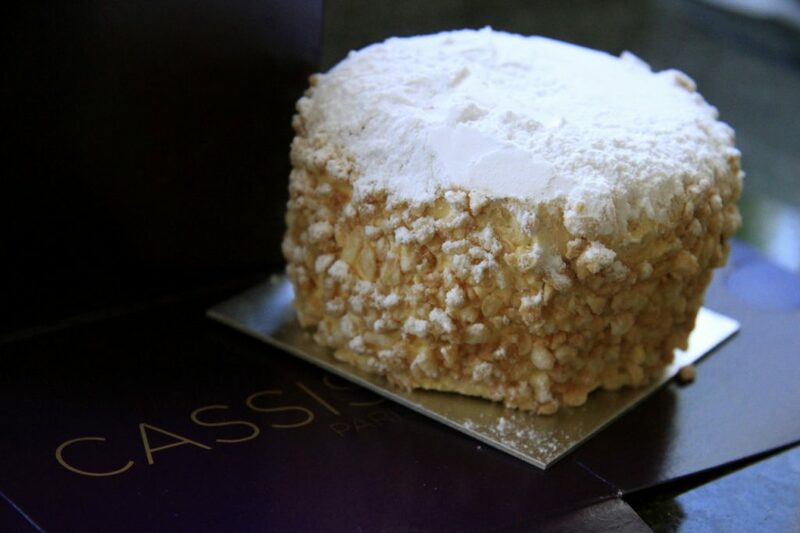 It’s not overly sugary, somehow managing to find a perfect balance: crumbly and creamy, sweet and tart, crunchy and chewy. It’s an extremely light dessert and worth every spoonful of however many calories happen to come your way. I also tried the Pain au Chocolat, a bag of Almond Tuile, and the Portefeuille Apricot. My favourite of the three was the apricot danish, with the crisp layers of pastry giving way to apricots cooked just long enough to burst into juice as they reach your mouth, with smooth clumps of vanilla custard hot on its heels. The almond tuile was a close second: firm crusts of almond sweetness that would go perfectly with a cup of tea. And even better with hot chocolate, of course. Best of all, you’d be very surprised at how accommodating the numbers are on Chef Moreau’s price tags. Far less than what you’d pay for a dessert at just about any restaurant in the city. So there’s no excuse not to race over to your nearest store and walk out with a few purple boxes under your arm. Then rush straight home, grab a fork, close your eyes and think of Paris. Bon appétit! Hi jason, thank you for the kind words. Love your photos! Next time try my favorite the lemon tart, you won’t be disappointed. Thanks so much for commenting Andrea :) I’ll be back again (and again) and make sure that I sample one or two (or five) other delights, including the lemon tart!